If you would like Perspektive Design to help with your next brand development, web project, event launch, social media promotion or creative project, please contact Perspektive Design today. 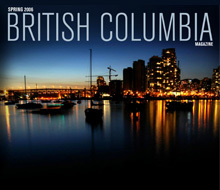 Check out this recent addition to our portfolio section – A redesign project of British Columbia magazine. This project included a redesign concept for the cover of the magazine and the design of an inner article spread. © 2013 Perspektive Design. All rights reserved.